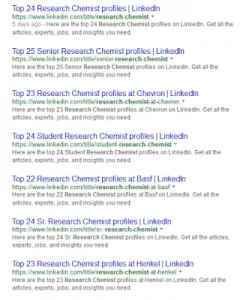 Did you know that LinkedIn lists “Top 25” profiles of people and categories under virtually any criteria you can think of? As a LinkedIn User, you have to do the search in a Private Browsing window, (incognito mode) otherwise you will see something different and it might also affect your LinkedIn Advanced Search “commercial limit”. Private searching can be an important factor for discovering your personal ranking, which can enhance or detract from internet sourcing that recruiters use to find candidates for their job search assignments. There are many advantages and benefits on having your personal LinkedIn profile optimized based on the key words of your job titles and expertise. This can be a huge competitive advantage of getting found by recruiters. Of course, the real world application of this comes into play when using more complex search logic than just a job title, but I hope this demonstrates there is real power in the Advanced Search Techniques used by almost every search firm today. The Bottom Line: Get your LinkedIn Profile Optimized or Get Left Out!